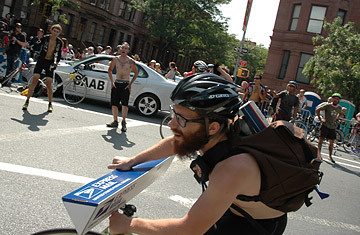 Dwain Walters, 21, competes in a relay race for bike messengers at this year's Harlem Rocks 35th Annual Skyscraper Cycling Classic in Marcus Garvey Park. The moment the fresh batch of competitors walked their bikes to the starting line, spectators could tell that this group of cyclists were not quite the professional bikers who were racing earlier in the day. These riders had tattoos of pirates and skeletons covering the length of their arms. Some wore cut-off shorts instead of spandex. And all of them had canvas work bags slung over their shoulders as they clutched their handlebars, ready for their race to begin. When they are not busy delivering packages, most of these New York bike messengers see the city streets as their unofficial playground, and at times, their illegal racetrack, facing off in street contests they call "alley cat races." But on June 15, they participated in a different kind of race  one that did not involve dodging pedestrians or weaving through rush-hour traffic at 25 miles an hour. There are differences between the messengers and the pros. The street riders' pre-race diet is often beer instead of energy drinks. It was also an alien locale. The race, part of this year's Harlem Rocks 35th Annual Skyscraper Cycling Classic, was held in Marcus Garvey Park, up by Fifth Avenue and 120th Street. Many bike messengers rarely travel above 100th Street since most of their business keeps them downtown. Still, says James "Speedy" Hines, a Harlem resident and a bike messenger for two decades: "It feels phenomenal, man. Just to be racing amongst the pros  I feel like a pro biker." There had been some nervousness among the messengers before the contest. They would be on the same race track as professional cyclists who are used to biking long distances on a set course without stopping; some of those have even qualified for the Tour de France. The pros had slick helmets, fancy bikes and numbers pinned onto the backs of their shirts. The professional men's category consisted of 45 laps around the track, and onlookers gathered on front stoops as the cyclists flew by in a streak of color and a gust of wind. But the messengers were a spectacle themselves. They came to the tracks bare-chested and body-pierced. And while their race wasn't along crowded city streets, it was designed to resemble their daily jobs. Teams of three took turns speeding around the track and picking up a variety of cardboard packages and envelopes they had to carry in their bags, or any way they could. Their driving motivation was a $1,000 prize, and in the end, longtime messengers Carlos Ramirez, Alfred Bobe, Jr. and Hines managed to beat the younger riders in a last-minute upset. Split three ways, that means each rider made a little over $300 in roughly five minutes. The winner of the pro race walked away with $10,000. Still, the amateurs seem to have helped boost the event. Although this race used to draw big names like former Olympian Danny Clark and Tour de France workhorse George Hincapie, as well as amateurs, organizers say attendance at this four-corner criterium (a short race course) has suffered in more recent years. To liven things up a bit, Eustice decided to bring two very different cycling cultures together on the same 3/4-mile course along the brownstone-lined streets of Harlem  the pros and the bike messengers. "I almost look at them as the artists colonizing the big race," says Eustice, who organized the event. "When you want to make something cool, you bring in the artists." It has certainly paid off for the Harlem Rocks bike tournament. The event was broadcast live on television for the first time in its history.